As a re-constructer of the theological convention of the traditionist school (Ashab al-hadith), and a critic of major Muslim thinkers, Ibn Taymiyya is one of the most influential figures in Islamic intellectual history. His focus on philosophical debates provided him with a deeper rational approach, despite his traditionist background, as well as a confrontational stance on intellectual issues and figures. However, biographers, as well as historians of Islamic thought, highlight only his traditionism and influence on contemporary Salafism, and generally neglect the critical and rational aspects of his thought. In addition, he is charged with being the main source of Islamic radicalism, Wahhabism, or modern fundamentalism. The complexity of his critique, and especially the aspects of his alternative Qur'anic rationality were so far underestimated. 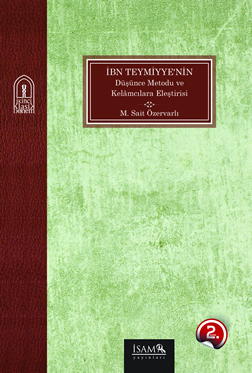 This book, rather than covering all his views on Islamic theology, aims to explore the foundations and the methodological distinctiveness of Ibn Taymiyya’s thought, through an examination of his critique of the mutakallimun, i.e. classical Muslim theologians. **This edition of the work is published among the Late Classical Period Project outputs.